Softeon, a top global provider of WMS, Distributed Order Management (DOM) and other supply chain software solutions, was the second-ranked WMS provider in each of the following use cases: Level 2/3 Warehouse Operations, Level 4 Warehouse Operation, and Level 5 Warehouse Operation - the most complex - based on Gartner’s warehouse stratification model. Softeon’s advanced WMS capabilities include task optimization, order picking, e-fulfillment, labor and resource management, advanced cartonization and pallet building, powerful kitting and assembly, along with materials handling and ERP integration. Softeon WMS powers many great logistics performers including Duluth Trading Co., The Honest Company, Sears Home Services, DB Schenker, Casey’s General Stores, Lenova, Denso, and Suncast. Softeon continues to “up the ante” with its Distribution Center of the Future innovation lab, which has already lead to the release of the new Order Fulfillment System (OFS), a unique and powerful solution that directly manages a variety of picking subsystems (smart carts, Voice, pick-to-light, put walls, mobile robots, etc.) without the need for any third-party control systems. 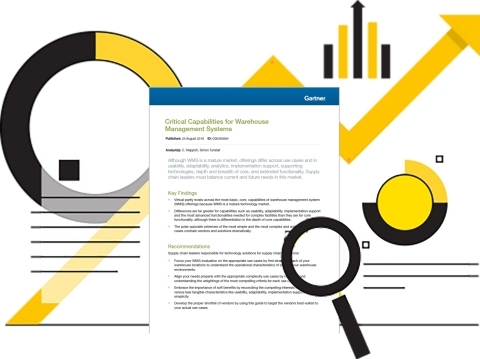 Softeon was the second-ranked WMS in the Gartner WMS Critical Capabilities Report, which uses nine key differentiating functional capability factors.